During the last two decades, the treatment of multiple myeloma (MM) has produced significant improvements in overall survival and quality of life. This can be attributed to the use of autologous stem cell transplantation, novel drugs in combination with old drugs, bisphosphonates, improved supportive care, and, importantly, dissemination of knowledge about the disease and treatments through multiple societies and medical centers. Despite the overall improvement, according to National Cancer Institute, there will be an estimated 24,050 new myeloma patients diagnosed (this number keeps going up), and 11,090 deaths from myeloma in 2014. Thus, our work has just begun and more need to be done. Progress is continuing by adding new drugs to our armamentarium, such as the approval of carfilzomib and pomalidomide in the last 2 years. Looking at the Multiple Myeloma Research Foundation website, there are 13 ongoing clinical trials for newly diagnosed MM, 127 clinical trials for relapsed MM, and 117 trials for refractory MM. According to the NCCN 2.2014 guidelines, 6 different drug combinations are listed for induction therapy in newly diagnosed MM patient with another potential 4 alternate combinations. These promising therapies are great news for multiple myeloma patients. Clearly, there is no curative combination as yet and no one treatment fits all. Thus the challenge is how (and when) to use these resources in order to produce the best outcomes for patients. This is indeed the main theme for the multidisciplinary topic in this issue. 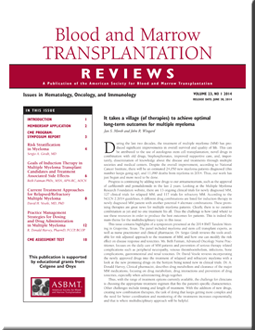 This issue contains highlights of a symposium presented at the 2014 BMT Tandem Meeting in Grapevine, Texas. The panel included myeloma and stem cell transplant experts, as well as nurse practitioner and clinical pharmacist. Dr. Sergio Giralt reviews the tools available for risk adjusted approach to the treatment of MM, and how one can modify the risk effect on disease response and toxicities. Ms. Beth Faiman, Advanced Oncology Nurse Practitioner, focuses on the daily care of MM patients and prevention of serious therapy related complications such as peripheral neuropathy, venous thromboembolism, infections, bone complications, gastrointestinal and renal toxicities. Dr. David Vesole reviews incorporating the newly approved drugs into the treatment of relapsed and refractory myeloma with a look at the new promising drugs on the horizon being tested now in clinical trials. Dr. A. Donald Harvey, Clinical pharmacist, describes drug metabolism and clearance of the major MM medications, focusing on drug metabolism, drug interactions and prevention of drug toxicities, especially when administering drugs together. Thus, with the range of treatment options currently available, the challenge for clinicians is choosing the appropriate treatment regimen that fits the patient’s specific characteristics. Other challenges include timing and length of treatment. With the addition of new drugs, creating new combination therapies, the task of doing that keeps getting more complex and the need for better coordination and monitoring of the treatments increases exponentially, and that is where multidisciplinary approach will be helpful.